Writing the perfect thank you note to teacher is challenging. 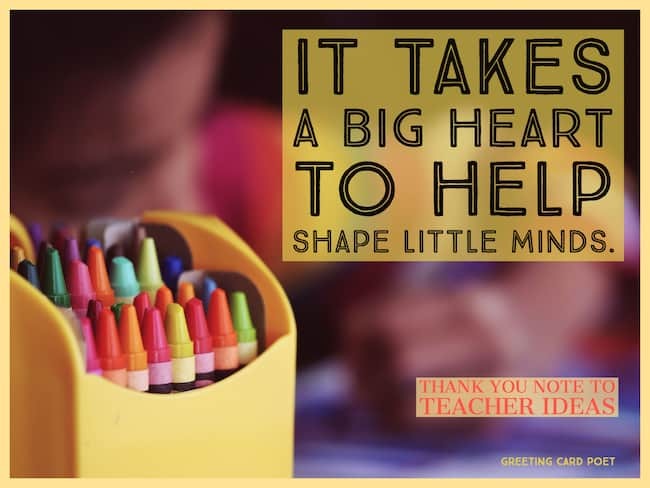 How do you thank someone who has taken you from crayons to perfume? (Oops, sorry, that’s from To Sir With Love.) But, seriously, all professions owe a big note of appreciation to the teaching profession. 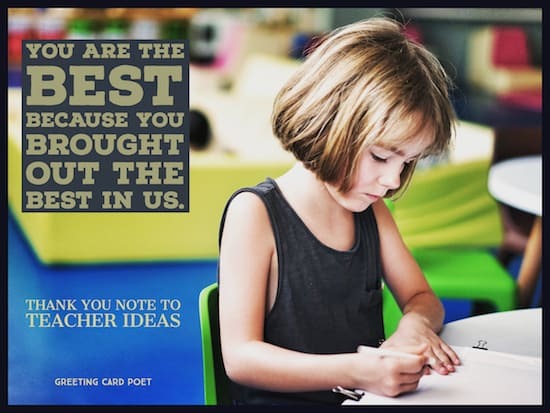 Whether you’re the pupil or the parent of a pupil, at the end of each school year and throughout the year, it makes sense to send a note of appreciation to an educator. It is easy to take you for granted but it is difficult to forget your inspirational words. It is easy to misbehave in class but it is difficult to overlook your motivational advice. Thanks for overlooking our EASY’s and never forgetting to do your DIFFICULT’s. Right now I am doing exactly what you have always taught me to do when someone does something nice for you – say thank you. I’m filled with gratitude for having you as my teacher. It never felt like you taught to earn a wage – it always felt like you taught to make a difference in our lives. With appreciation. We may not say this every day but your inspirational words are like beautiful footprints that have been etched in our hearts and minds forever. Thanks. I’m grateful for you going out of your way and teaching us life’s lessons which we would have never learnt from textbooks. We are well-grown plants who bear fruits of success, and definitely, you are the gardeners! 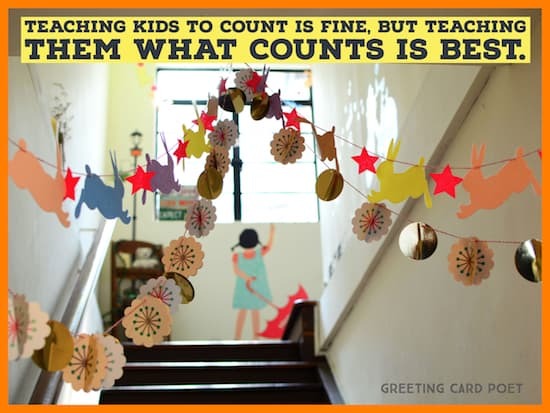 Thank you, our dear teachers! We know that teaching can sometimes be a tough job, today we want to express our appreciation for you giving us an education so priceless. I learned a lot of principles from you, but the best ones are the principles of life. And, I appreciate all you’ve done. Your job is stressful and the hours are long, but you are always kind and understanding. I am grateful to have been taught by such an wonderful person. Your time and guidance has meant more to me than mere words could ever express. You taught me without judging me for my ignorance, and always met my misdirected ways with understanding. I appreciate you being the best teacher, guide, and friend that I have ever had. 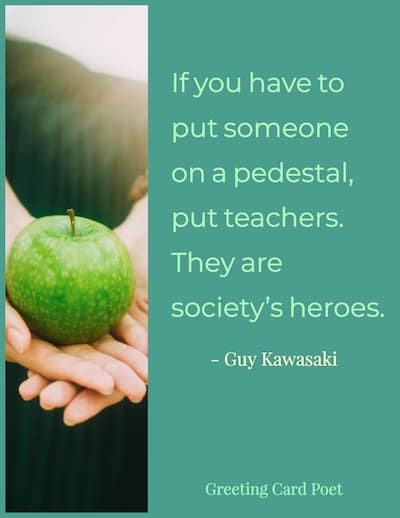 To the world you may just be a teacher, but to your students you are a hero. Not all superheroes have capes, some have Teaching Degrees. We knew how to handle problems so well because of your teachings. I don’t owe my professional success to my destiny, courage, luck, belief, confidence or fortune. 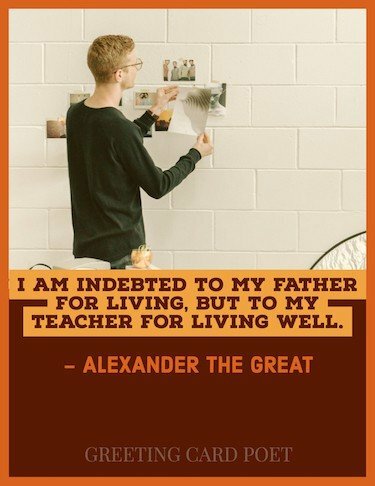 I owe it to a wonderful teacher like you. I’m not sure how I’m going to live without your lessons and your words of wisdom. But I know that I can now go into the real world and be confident about who I am and what I can achieve. For all of this, I’m deeply grateful. The future of mankind lies not in the hands of new technological inventions and scientific breakthroughs. It lies in the hands of ambitious teachers like you… because that’s where it all starts from. The loving ways of teachers like you is the difference between teaching and educating. For teaching our children, educating them and empowering them, we are so grateful. Mere words could never express our gratitude to you for truly caring and being there for our child. I appreciate you for teaching him lessons that he will carry throughout his life’s journey and giving him fond classroom memories that he will treasure forever. The best lessons are not learned from a book, but from the hearts of truly great teachers like you. I’m so grateful for the important school and life lessons you taught our child. We’re so happy to have had you in our child’s life. Note: If you have any suggestions for our thank you note to teacher page, please let us know via the contact page. Thanks. You’re on thank you note to teacher page.